On a fiercely hot and sticky Monday morning in March, 2007, I set out for the ‘Netaji Centre’ in downtown Kuala Lumpur. 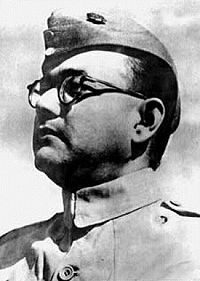 The Centre which is devoted to the memory of Indian nationalist Subhas Chandra Bose occupied a few dusty rooms in an nondescript shop house in India Town. near the lovely old mosque on the Klang. In the hot sun, the streets pulse with colour. Every shop front is painted an intense green or yellow or red. The Centre is up a very dark flight of stairs. Sitting in the gloom at the top is Lt. Das, a wizened veteran of the Indian National Army. He has forgotten the key to office and we are waiting for the director of the centre who will, he promised, be along shortly. Lt. Das is old and frail, his deeply wrinkled face a rich mahogany brown. As we wait, he deflects my question about the INA to deprecate Gandhi – speaking as if the Mahatma was still alive. ‘He was an evil man,’ says Das with a shudder. At last we are let into the office. It’s very dark. On the wall, I can just make out a dark hued studio portrait of Bose wearing his INA uniform. He looks far into the distance, towards the end of the British Raj. He would be dead – though many still deny this - by the time Indian became independent in 1947. For Lt. Das, I suspect, Bose is the third man in the room. Surprisingly, Lt Das knows very little about the German ‘Indische Legion’ that Bose recruited in Nazi Germany. For him, the big story was always here – in what was in 1943, Japanese occupied Malaya. The last act of Bose’s story had begun six thousand miles away in Berlin. The photograph above shows him with SS chief Heinrich Himmler. Shortly before Bose was scheduled to leave Germany, the Japanese Naval Command raised objections because of a regulation not permitting civilians to travel on warships in wartime. When Trott received this message by cable from the German Ambassador in Tokyo, he was dismayed. He was longing to be rid of his Indian friend and the Japanese had raised a number of objections: they were clearly very uncertain about into their theatre of the war. This time, Trott sent a determined reply: ‘Subhas Chandra Bose is by no means a private person, but Commander-in-Chief of the Indian Liberation Army.’ The Japanese relented. One suspects that the staff of the Sonderreferat breathed a very deep sigh of relief. On the 8th February 1943, Subhas Chandra Bose accompanied by his wife and his adjutant Abid Hasan Safrani, who was under the impression he and Bose were going to Greece, travelled to the port of Kiel. Here Keppler, Werth and Nambiar had arrived to say farewell. Emilie watched as a motor launch took Netaji out across the harbour to the waiting submarine. She would never see him again. The 1500 ton U-180, commanded by Korvettenkapitän Werner Musenberg, was brand new - and fast. But it was hardly a pleasant environment in which to spend two and a half months. Hasan recalled that when he arrived in Kiel, he had felt entranced by the romance of a long voyage: as soon as he climbed down into the claustrophobic submarine, that feeling was instantly extinguished. The U-boat crew knew nothing about their destination. Nor had they been informed who was travelling with them until one crew member identified Bose. He had seen a picture of him in the newspaper and referred to him the ‘Indian Adolf’. The voyage ahead was a perilous one. The Atlantic was heavily blockaded and according to Ronald Lewin, an expert on Allied intelligence quoted by Gordon ‘Special messages were transmitted to [Bose] by radio to keep him abreast of the nationalist situation. Intercepted and deciphered, these told the Allies not only about his presence aboard but also a great deal about the Free India movement…’ Musenberg set a course that took the U-180 north along Norwegian coast, then making a turn west towards the Faroe Islands. Seas were rough, and the two Indians became badly sea sick and depressed. The food was greasy and the air foetid with diesel oil and odours of confined men. Hasan had hoarded rice and lentils to improvise meals for Netaji. After ten days, the U-180 reached the Atlantic ocean and Musenberg at last turned south. 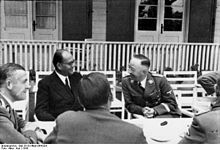 According to crew members Bose’s German was poor but Hasan was fluent and he enjoyed exchanging jokes about the Nazi leaders. Bose spent a lot of time writing: ‘‘Mein Kampf’ for the freedom of India,’ Hassan told the crew. Bose was indeed working on a new edition of ‘The Indian Struggle’, his most famous book. If as the intelligence reports imply, the British knew that Bose was now on board a U-Boat, and heading east, they made no attempt to intercept it – on 18th April, Musenberg was confident enough to attack and sink a British merchant ship, the Corbiss. Two months is a very long time for an inexperienced civilian to spend locked up in a submarine. To make use of the time, Bose and his highly intelligent secretary discussed how they would deal with the Japanese. In role-play sessions, Hasan took the role of the Japanese Prime Minister Tojo and interrogated Bose. At dawn on April 21st, 400 miles SW of Madagascar, the U-180 rendezvoused with a Japanese submarine the I-29 and exchanged signals. The weather was rough and the two captains had to wait twenty four hours for the sea to calm. Then Bose and Hasan were fitted with life jackets, transferred to a rubber raft and rowed across to the I-29. Two Japanese engineers then took their places on the U-180 – along with fifty bars of gold. Then the two submarines dived beneath the waves and set off home in opposite directions. After two years spent in Hitler’s Reich, Bose was now a guest of the Japanese Imperial Navy. When the U-180 finally returned to Kiel, Musenberg and his crew had completed a journey of 15,000 nautical miles and been away from home for five months. In the meantime, the I-29 reached the little island of Sabang on May 6th – where Bose and Hasan were welcomed by Colonel Yamamoto, and Senda, an important member of the Iwakuro Kikan, the Japanese-Indian liaison group. It was a glorious relief to escape the claustrophobic steel sarcophagus of the German submarine. Yamamoto, Senda and the two Indians boarded an aircraft which flew them to Singapore. Here Bose hopped over the causeway to what is now the modern state of Johore where he was put up at the Sultan’s Palace at Bukit Serene. Here he met Rash Behari Bose. Together, the two unrelated Boses were flown across the Pacific to Tokyo, where they touched down on 16 May. Here Bose took on his third false identity, as a VIP called ‘Matsuda’ – the Japanese version of Mazotta – the name he had used in Italy.